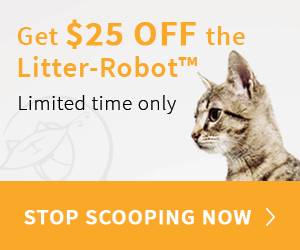 While we all love our fur-babies, some of our kitty companions can become a little too rambunctious when it comes to nibbling on their human friends. But rest assured, if the friendly nibbles go a little too far, there are ways to get most cats to stop biting, which we’ll share with you here. 1.) Get Inside Their Head — Kitties that are fearful are more likely to bite as a means of defending themselves. Try getting down on their level to learn what’s causing their fear, and then work to eliminate the source. This could be something in the environment that’s troubling them, or you may begin to see patterns in their behavior that are triggered at certain times of the day or around certain events. This is a wonderful way to avoid having to scold or discipline more than necessary, as you may be able to eliminate what’s prompting the biting altogether. 2.) Shhh! Loud Noise-Free Zone — Even the most courageous of all kitties can become “spooked” if sudden and unusually loud noises disrupt their normal routine, which in turn can prompt the unwanted biting. Independence Day is a good example with fireworks booming, champagne corks popping and crowds of boisterous guests cheering the celebration on. To kitties with sensitive ears, all the noise can be distressing which can trigger the cat to feel he needs to defend himself. Remember, cats can’t comprehend your explanations about the noises. 3.) 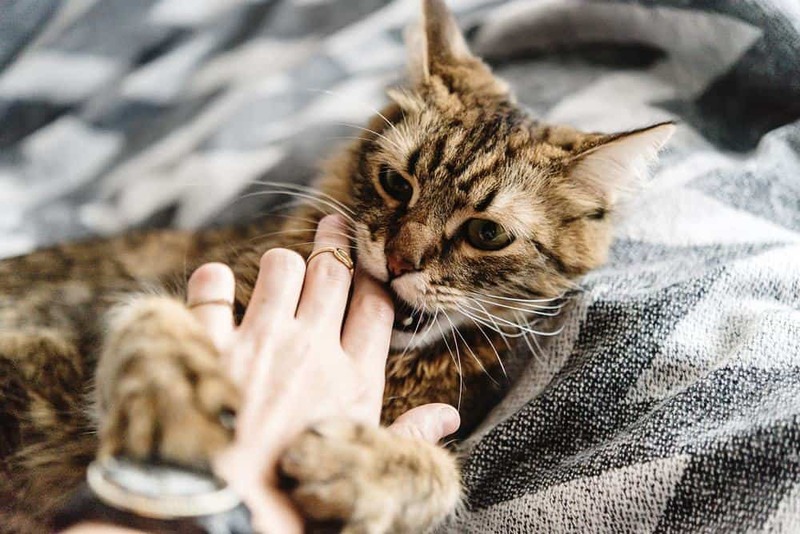 Stop Before the Biting Starts — Often times, cats bites can be a result of over-stimulation, petting or play – so your very best bet is to pay attention to the signals your kitty is giving you and stop before the biting starts. 4.) Introduce Them To Strangers — Having guests over? Make sure their entrance is as calm as possible and that your kitty has time to check out the new arrivals. It would be wise to do this on her terms, which could include plenty of distance between her and your guests and time to warm up to them before being placed in a position where she feels vulnerable. The more comfortable she feels with your visitors, the less likely she is to sink her teeth into them. 5.) 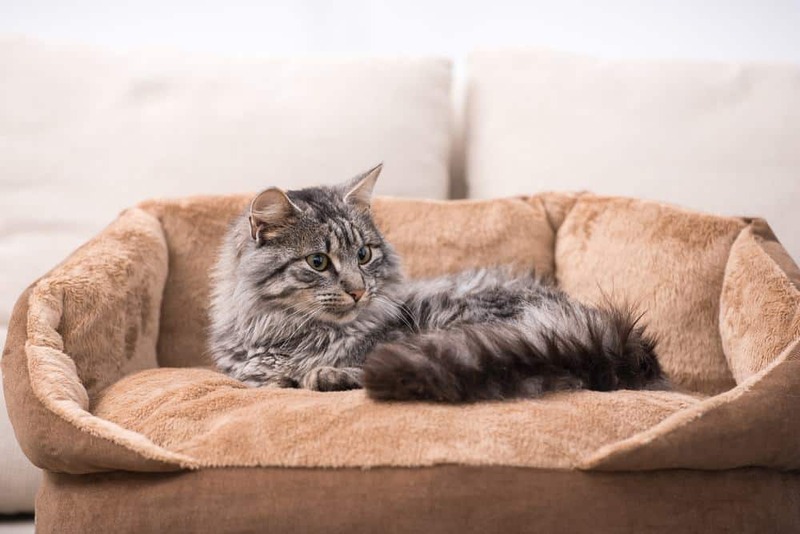 Prepare A Safe Haven — If your cat is tucked safely away in a back bedroom while you entertain, chances are, none of your guests will feel the wrath of kitty fear. It’s important to make sure that the cat does not feel as though she’s being punished, but instead being provided with her own little sanctuary. 6.) Don’t Let Your Kitty Get Bored — Sometimes biting can be a sign of boredom. If the cat desires more of your attention than he’s getting, he may turn to biting because he’s aware that he’ll get a reaction out of you! Instead, provide your kitty with enough stimulation so he’ll feel satisfied and less inclined to use you as a human play chew toy. Kitty perches for climbing, scratching posts, and an array of cat-friendly toys can redirect his attention, and nibbling, away from you. 7.) 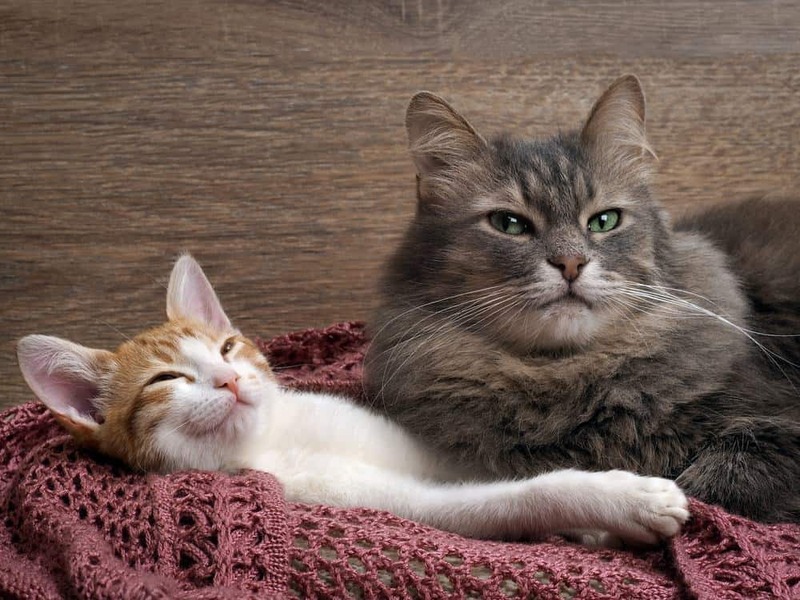 Get Her A Buddy — Introducing a new cat to the household takes a bit of time and patience, but look at your situation to determine if another cat friend might be just what your cat needs. Many cats enjoy the companionship of a fellow feline which can be another means of redirecting the attention away from you. 8.) Don’t Encourage Bad Behavior — Never use your fingers for toys or laugh at her nibbles. This will only encourage the activity and your cat is not able to distinguish between playful and unwanted biting, so best to discourage it altogether. 9.) 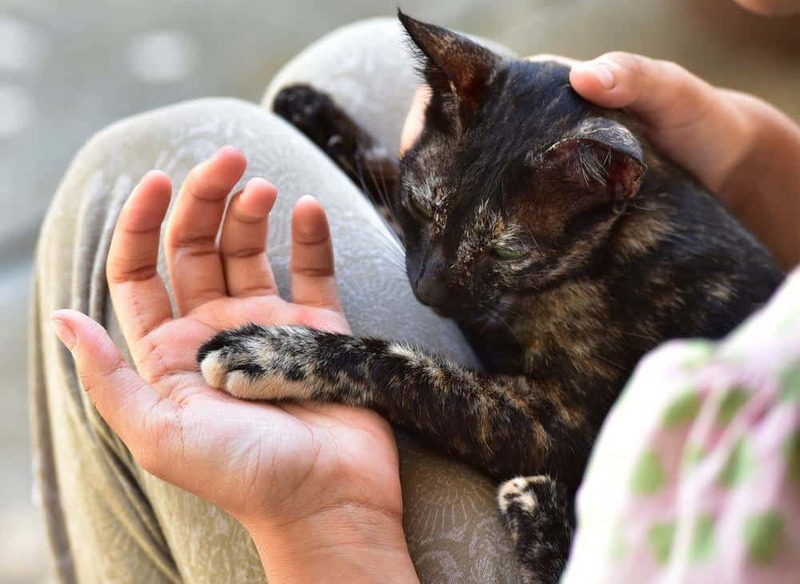 Persistence and Patience — A wonderful way to show love to your cat is to be patient, yet firm in dealing with unwanted behavior. Once your cat learns behaviors to avoid, the two of you will have a much happier and contented relationship. As always, be loving, kind and patient with your furry baby, but recognize that successful behavior modification takes persistence and consistency. In the end, your relationship will be better if kitty rules are set and understood. Many sites will recommend you “show them who is boss” or use scare tactics, like spray bottles or noisy cans of coins. Know that this is based on an old training paradigm that says that animals do things because they want the upper hand. This is simply not true. Cats do what works. If biting either gets attention or gets someone to go away they will do it again. Whether working with cats, dogs or any animal “asserting one’s dominance” is a vague idea that always leads to punishment. Yelling at a cat can and will in many cases only increase the aggressive behavior. Using the word “no” may interrupt the behavior but it gives no information on how we expect the animal to behave. Aversives should never be used with cats as they can actually increase or create aggressive behavior! Have you successfully used any of the techniques above to get your cat to stop biting? Or, have you tried other methods successfully that you would like to share with our other readers? We’d love to hear from you! Whenever mine starts to get over stimulated from petting and starts to bite, I immediately still my hand and tell her in a firm but quiet tone, ‘No. Stop,’ until she releases me. Then i remove my hand slowly and walk away. It’s taken two years but she rarely bites me now and I now can gently rub her belly without her biting me and she enjoys it. My cat is stalking me and then biting my hands for no apparent reason. I don’t know how to stop him. I tried saying no and a few other things but nothing works except to move away from him and then he follows me around hoping for another chance to bite me. It only lasts about ten minutes and then he gives up but tries again another day. His worse time is at night when I go to bed and he also will do it when I am watching tv. He drew blood the last time so it kind of scared me. I was hoping Jackson Galaxy could help with this. I watch his Cat from hell series all the time but so far haven’t seen anything I can do. Cats discipline each other with a spit and hiss. The nearest I can get to copy this is to blow in their faces, if necessary, making a ‘shh’ noise, and they always back off and get the message.